Look what the cat dragged out of the bag! The speaker and his co-workers were serving as greeters for a Christmas Eve service. A mutual friend was approaching from a distance and the speaker casually but jokingly yelled this malaphor out. 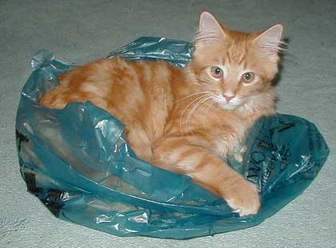 It is a nice mash up of two idioms involving the word “cat” – “look at what the cat dragged in” (exclamation about a person who just arrived, presumably late) and “the cat is out of the bag” (the secret has been revealed). A big thanks to Joel who uttered this mixed metaphor and for sending it in! I expect to see more from him as he has a reputation for unintentional idiom blending! Hey, the cat has been dragged and is out of the bag about the new malaphor book that is sweeping the nation! It’s called He Smokes Like a Fish and other Malaphors and is available on Amazon NOW! It’s the top of the notch!